Maternal And Child Health Care Is Lagos Winning The Battle? It was the first pregnancy of 25-year-old Nafisat (not real name). Like any expectant mother, she was excited and hopeful. In fact, she was always willing to help new mums in the prenatal clinic she visited, seeing her own future child in those little babies. On her due date, she had gone into labour. She didn’t labour for long – after about three pushes, her baby was born. Unfortunately, the child only lived for a few minutes. The reason for its death was not known and no information was given. The joy of pregnancy and childbirth is the hope and desire of many families. Sadly, in many parts of Nigeria, this is not quite the case. In such places, keeping babies – and, sometimes, their mothers – alive in the first five years is a perennial battle. Newborn, under-5 and even under-10 mortalities are still a nightmare for parents and health workers. In the past few years alone, money and expertise have been invested in altering Nigeria’s position as the second largest contributor to maternal mortality worldwide through initiatives such as the World Bank-supported Saving One Million Lives Initiative and the UK government-funded Maternal, Newborn and Child Health Programme (MNCH2). The reason for these interventions is clear: more than 80 percent of newborn deaths are the result of premature birth, complications during labour and delivery, and infections such as sepsis, meningitis and pneumonia. Even more devastating is the knowledge that, according to recent research, essential interventions reaching women and babies on time would have prevented most of these deaths. As at 2003, over 50 per cent of the births in Nigeria still occurred at home; the women would rather go to traditional birth attendants most of whom are unqualified. In addition, only slightly more than one-third of births are attended by doctors, nurses, or midwives while children keep dying from a variety of ailments from haemorrhage to malaria. The lack of personal hygiene, malnutrition and inadequate preparedness of mothers also contribute to their vulnerability and the eventual surrender of their babies to the cold hands of death. Underneath the statistics of child mortality lies the pain of human tragedy for thousands of families that have lost their loved ones. Is there an end in sight? Today, on a daily basis, Nigeria loses about 2,300 under-five-year-olds and 145 women of childbearing age. 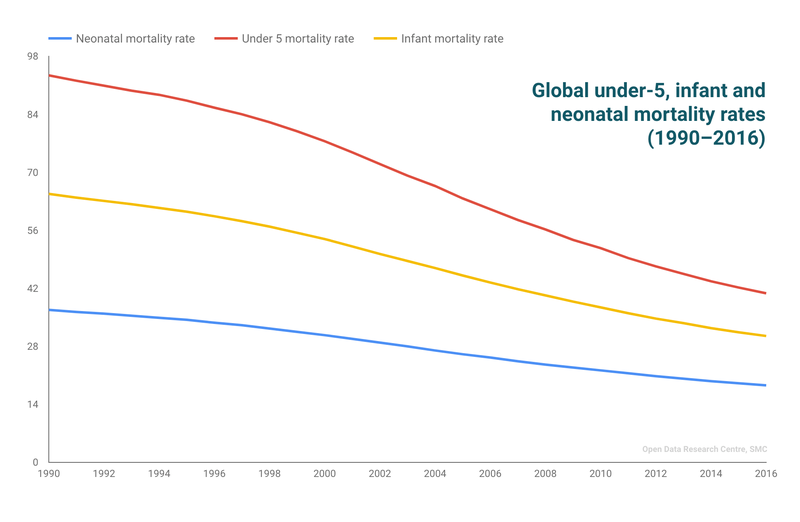 Although analyses of recent trends show that Nigeria has made some progress in cutting down infant and under-five mortality rates, the pace remains too slow to achieve the target of ending preventable deaths of newborns and children before 2030. Yet, while the nation, as a whole, scrambles to achieve the sustainable development goals (SDGs), there appears to be a glimmer of hope in some parts. Among other States in the country, Lagos appears to be the one that has recorded some successes in ensuring that maternal mortality is at one of the lowest in recent times. Indeed, there have been suggestions that previously high under-5 mortality rates have been put under control. Perhaps, this is not unrelated to the recent purchase of important equipment such as delivery kits, apparatus for neonatal services and a variety of drugs for obstetric and post-natal care. Recently, the Lagos government outlined some of its achievements in the health sector including the acquisition of an electronic health records system to reduce patients’ waiting time “to the barest minimum”. The last few years also saw the development of health infrastructure and the procurement of various facilities from power generators to x-ray machines at some of its General Hospitals. While new equipment and facilities may support claims about the positive situation of health in Lagos, actual confirmation of progress can only emerge from available data on its health sector. Comprehensive information on public services in Lagos is a very scarce commodity. However, errors made using inadequate data are often much less than those using no data at all because they can help unearth critical, hitherto unknown, facts. 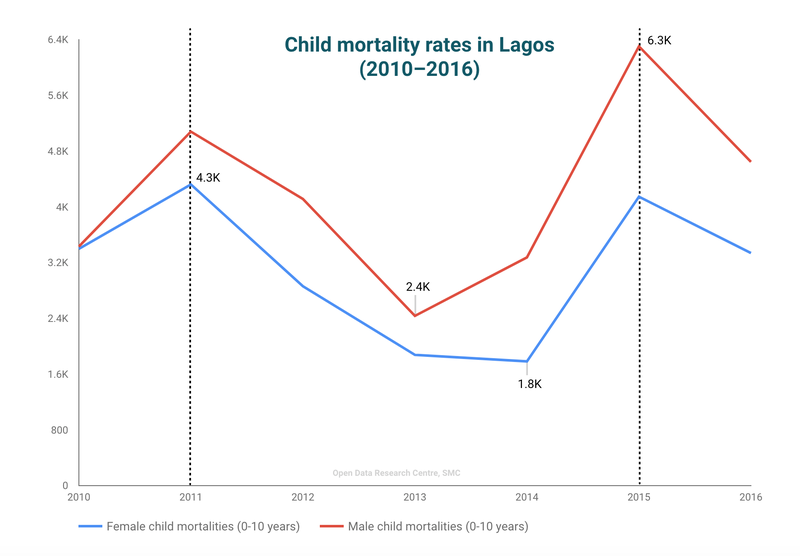 For example, data on child health received from the Lagos State government in 2018 reveals some curious patterns: isolated spikes in the mortality of children aged 1-10 in 2011 and 2015 after declining in the two years before. It raises key questions about why so many children die in that period. While the reason may not immediately clear, it is relevant to the analyses that both were years in which general elections took place across the country, including Lagos State. Although there are no studies establishing a correlation between election years and aggravated rates of infant mortality, the data draws attention to the possibility of a connection. If a theory could be put forward about the surge in 2015, it would point to the prolonged period it took the Akinwunmi Ambode administration to appoint its commissioners, as well as those of the State’s ministry of health under whose leadership the primary health sector was to operate. As is well-known, election periods in Nigeria are characterised by a frenzied and heated polity. Apparently, this takes attention away from the implementation of public projects and puts far more focus on electoral campaigns than public governance. Ambode may have been distracted by the euphoria that trailed his election victory. A case in point: just before the 2015 elections, there was no Commissioner for Health in Lagos until towards the end of 2015 when Dr Jide Idris was reappointed. In addition to the election year of 2015, the seeds of the nationwide economic recession in 2016, which were sown between 2014 and 2015 with the crash in oil prices, may have also had early consequences of increased infant mortality in Lagos. However, this cannot account for the high rate experienced in 2011. In any case, the real problem is likely to lie deeper. Whether in an election year or recession, the health structures in a place like Lagos should function properly and depend less on external forces. To be described as a top-class destination for health in the country, Lagos should boast of a well-oiled system that can withstand the strains of wider political or economic situations. But does Lagos actually have such a system? Since access to private healthcare is expensive, facilities provided by the government are the most visited in Lagos. It is perhaps for this reason that the healthcare system in Lagos is one of the most sophisticated in the country. Yet, with its teeming population, what is available may actually be grossly inadequate for the more than 21 million people who reside there. The public health care system in Lagos comprises one tertiary health facility, about 26 General Hospitals, seven Maternal and Child Care Centres (MCCs), and 250 Primary Healthcare Centres (PHCs) spread across the state’s twenty local government areas. PHCs, like in other parts of the country, are sited in such a way as to ensure that residents can access basic healthcare services within their immediate localities without the need to travel long distances. The expectation is that only cases that cannot be handled at the primary level would be referred to the secondary and tertiary facilities. Routine services like checking blood pressure, immunization and the treatment of boils, sprains and other minor injuries are first to be checked at a PHC. Likewise, the Maternal and Child Care Centres were not designed to be the first port of call for attending to pregnant women except in situations of high-risk pregnancies. They are emergency referral centres for cases of complications that arise during labour. In 2012, the former Governor of Lagos State, Babatunde Raji Fashola launched the Lagos State Maternal Child Mortality Reduction (MCMR) program involving the upgrade of some PHCs with more equipment to make them flagship centres. Accordingly, 2013 and 2014 recorded the lowest mortality figures. But even then, the rates were still high enough to warrant concern about the healthcare delivery architecture in the state. In spite of the government’s efforts, the MCMR program did not do enough to tackle the dilapidation of PHC facilities that had begun during the run-up to the 2011 elections. The results of an independent assessment by the Lagos State Civil Society Partnership (LASCOP) and Innovation Matters on the state of the Primary Health Care (PHC) facilities in Lagos State in 2013 did not bode well for mothers and their children. That assessment found that seven PHCs were found to be lacking in basic emergency delivery and care equipment. Of the 29 PHCs inspected, seven did not have laboratory equipment with functional malaria and HIV test kits. Eleven out of 30 PHCs did not have ambulance services, while fifteen of them lacked power supply in the labour rooms. Only six PHCs had potable water supply, with twenty-four relying on wells and boreholes. The report also noted that ‘the water at Apapa PHC for example, was not clean for drinking because of the colour and there was no water purifying instrument’. At other centres surveyed, bad drainage systems caused flooding in raining seasons, creating difficulties in movement in addition to making them unsanitary for healthcare delivery. Furthermore, no PHC had a disability health specialist and none had inclusive facilities like ramps for wheelchair users. Only four out of 29 PHCs claimed they had Special Care Givers and counsellors but these staff were not specialized in disability affairs. It is a situation that has discouraged persons with disabilities from visiting PHCs in Lagos. Only four out of 24 PHCs claimed to have language interpreters, another crucial point for the lack of inclusiveness at these facilities. A woman had complained: ‘We don’t go to hospital! What for? If we go, we will see the nurse, [and] how do we tell the nurse what is paining us? Even when the nurses are talking they cannot let us know what they are saying unless I have an interpreter with me … (my daughter) … I cannot always have her with me. By the time I don’t talk, the nurses are impatient and will tell me to get out. Many of us don’t go because it is of no use.’ It is no surprise then that half of the women who made their monthly visits to PHCs for antenatal care reported being unhappy with staff attitudes. Admittedly, the survey was conducted five years ago. But the outcome of those decrepit conditions is still being felt today: fewer and fewer women are patronising PHCs; pregnant women are shunning health care centres for Traditional Birth Attendants (TBAs) or going directly to tertiary facilities like the MCCs for routine preliminary services. Unfortunately, most TBAs are not expertly trained to handle childbirth and some of its complications while the MCCs have quickly overrun their capacity. During this story, one of the writers paid regular visits to the Maternal and Child Care Centre at Amuwo-Odofin and saw things for herself. On each of those days, the spectacle was the same: delicate pregnant women, babies crying, people standing, the electrical power going on and off, making the environment not only stuffy but uncomfortably noisy with the sound of the generator. The hospital was usually under-staffed, yet many women would rather use its services than walk into less busy PHCs. “It is easier to have access to a Consultant Gynaecologist or Obstetrician”, one woman mentioned. Many women also had a lot to say about the (lack of) quality of customer service by the medical staff. The waiting time is often long because of the crowd. On some days, there are a hundred people or more. The writer had to wait for five hours to see a doctor. But this was nothing compared with the agony of the woman who had given birth through a caesarean section just a few days before and complained of pain and swelling on the surgery spot. Although she had arrived at the Centre by 8am after dropping off her other children at school, she was still left unattended to by 5pm. It took the intervention of other women appealing to the matron for her to be allowed to see the doctor. At that point, the nursing mother was already walking away frustrated and in tears. Health centres like this one are overwhelmed principally because they continue to attract people who should be visiting PHCs closest to them. The PHCs were built to attend to many of the cases for which people stream to secondary and tertiary centres but, ultimately, they are still deemed not to be in satisfactory condition to cater for even the basic services required by expecting mothers or their newborn children. Despite the apparent facelift given to PHCs in 2012 (through the MCMR program) as well as recent claims of progress by the present administration, the Lagos health care system still has some way to go to significantly attenuate the plight of mothers and their children in Lagos. The first lies in the trend earlier identified, namely, the neglect of public health facilities in election season. From available data, one can tell that Lagos State is approaching that time when many lives could be lost. On the cusp of another election year, it is imperative that the trend noticed in 2011 and 2015 be curtailed in order to forestall a recurrence. With the anxieties of electoral campaigns and political manoeuvrings heating up, the lives of mothers and children are at stake and another upward spike in the mortality rates is definitely undesirable. The second reason for the poor state of PHCs today is based on the assumption that the Lagos State government is actually doing enough, within the limits of available resources, to upgrade the facilities available in the various health centres including the PHCs. In this case, the problem would point to the lack of sufficient and effective communication to the public about new developments in the Lagos health sector. The solution to this problem does not lie in the occasional publications released by the government on its web channel or through carefully-worded press releases sent to newspapers. (Unfortunately, the information released through those outlets often lack substance because they are filled with questionable claims that cannot be publicly verified.) Rather, the problem can and should be overcome by the proactive and systematic publication of data related to the provision of health in the State: infrastructure, healthcare and policy. By 2050, it is projected that there will be three times as many people in Lagos as there are today, a possibility that should lead to concerted, sustainable and data-driven measures to ensure a safe and welcoming environment for the future population. The lack of awareness, the lack of data from the State government impacts on other public services. The availability of public health data can make life-altering changes in patient education, treatment and more. Data also serves the government in policy and budgetary planning to improve services and for better planning. The Lagos State Health Insurance Scheme, for example, needs quality data to work effectively. The benefits of data cannot be overstated. When they are publicly disclosed, government processes can be constructively scrutinised and ameliorated. With data, citizens can collaborate with the government in tackling the challenges they face. Although examples of data-driven enhancements to the health sector exist in Nigeria and other countries, Lagos can take the lead in creating a culture of data disclosure or risk losing its position as an exemplar of international cooperation and public development for its benefactors. Families need these interventions. Nigeria needs this kind of leadership and initiative. And Lagos can show how to truly win the battle against maternal and child mortality if its government pays more attention to data and proactively shares it with the public. If it did, perhaps Nafisat would have also experienced the joy of those mothers to whom she had offered her selfless help.